Hiya guys! Yesterday I may have been all happy and peppy, but that's not so much so the case right now. Okay... I may be a little grouchy due to lack of sleep. Somehow at 3am I decided it would be a great idea to stay up until... like now. I'm insane, I know. Polish on the brain keeps me awake, it's totally not my fault but all these amazing creators pumping out stunner after stunner. Needless to say I am also a super excited polish addict waiting for Polish Pickup in just a few days. I'm at the point where if I don't stop going over my wishlist I'll end up adding everything. The polish addict in me says 'yassss' but my wallet (and husband) says 'nooo', haha. That said, here's another one that needs to make your final list. For today I'm sharing swatches for Cocoon Galaxy by Contrary Polish, which is the April contribution to the Polish Pickup Collaboration. Not only that, but Carrie has another stunning lip balm this month. Enough with the talking, let's get to the polish! Cocoon Galaxy by Contrary Polish will be available for purchase through the Polish Pickup Shop Friday, April 6th at 11AM EST through April 9th. The full-size 15mL shade will retail for $13 each and there is no cap this month! If you're not familiar with the concept, the Polish Pickup offers a fun, interactive experience that allows you to submit theme ideas, vote for your favorite theme, and selectively purchase your favorite polishes every month. As I mentioned before, the theme that was voted for April is Across the Universe. This month Carrie found her inspiration from a photo by NASA/ESA Hubble Space Telescope. Cocoon Galaxy can be described as a muted periwinkle magnetic polish with pink shimmer, holo microflakes, and antique gold magnetic shimmer. Please note: every polish will come with either a cat eye or neodymium magnet. The formula has a sheer application that builds-up perfectly for full coverage. It has a balanced consistency, not too thick or too thin. I cannot not get over how seamless the application felt while layering. So smooth and creamy, aces all around when it comes to the polish formula. Now as I said before, the magnet effect is extremely subtle but it is as intended and works well against the base. It dries down to a very smooth semi-matte finish on its own. Shown in two coats and sealed with a glossy topcoat. Also this month Contrary Polish is debuting another fantastic lip balm! Solar Flare is a sheer lip balm in an orangey-red hue with a sunny lemon flavor (lemon zest, mandarin orange, and a creamy sugary base). Inspired by the NASA pic of a coronal mass ejection. Ever since my first lip balm from Carrie back in February I have been anxious to try out more colors from her. But it's not just the perfect touch of color that gets me, it's the formula. It glistens your lips without having to feel sticky or greasy. And the smell (and taste cause that stuff just happens I swear I'm not eating it) is absolutely amazing and feels long lasting. Definitely recommend this balm, especially for those ladies who just like a touch of color and nothing dramatic on their lips. 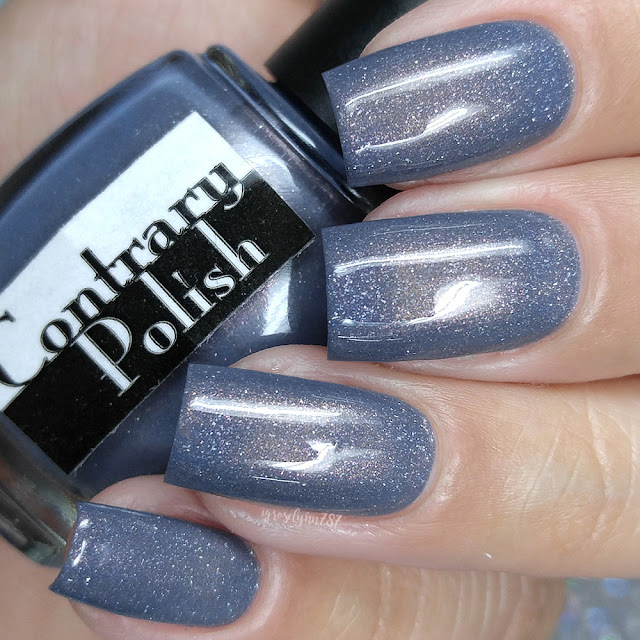 To recap, Cocoon Galaxy by Contrary Polish will be available for purchase through the Polish Pickup Shop Friday, April 6th at 11AM EST through April 9th. 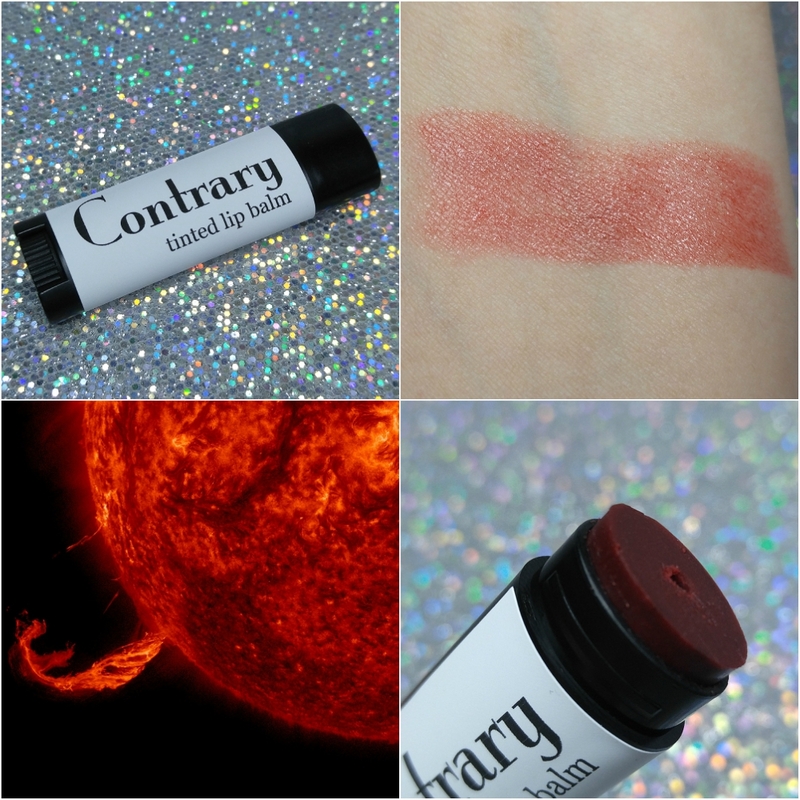 The full-size 15mL shade will retail for $13 each and there is no cap this month! I so hate being on good behavior. It better end soon.